ETTA | Gallup Talent Themes – Now, Discover Your Strengths! Gallup Talent Themes – Now, Discover Your Strengths! 04 Sep Gallup Talent Themes – Now, Discover Your Strengths! No great success has been reached with flaws and weaknesses. At the thought of having to get up to work tomorrow, Agnes feels energized. Full of enthusiasm, she is impatiently looking forward to the next day. At the mere thought of having to work tomorrow, Tom is already depressed. What is the difference? Most probably, at work Agnes has the opportunity to do what she appreciates and is capable of the most. Most probably, she is also ware of her strengths, actively reaching out to them during the day, drawing even greater joy and energy from whatever she does. Long-term research by Gallup Institute proves that people who are the most effective at work are aware of their strengths and are able to apply them in their day-to-day activities. The strengths based approach is also the core of positive psychology, which encourages to concentrate on resources, not on dysfunctions, claiming that no one succeeds by reaching out to their flaws and weaknesses. 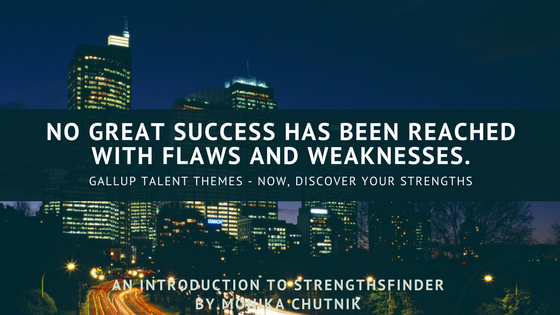 StrenghtsFinder’s talent themes are, however, not really strengths yet. If unconscious, inactive or underrated, talents may constitute the proverbial gold in the henhouse (I am quite sure that no hen will appreciate it). The assessment lets you identify your areas of potential, your most natural action mode – and a personal feedback with a development consultant or a coach will help you turn your talents into strengths, and find ways to reach out for the resources they offer. What I personally adore in the StrentghsFinder report is that it does not assign anyone to one of a meager three or four types. Unlike many other assessment tools, it is far from putting people into narrow boxes. Five basic talent themes, the so-called Signature Themes, constituting our “personal signature”, are available in thousands of combinations. Thanks to the talent and strength perspective we really feel – and we become exceptional. What kind of talent does the Clifton’s StrentghsFinder diagnose? Below you will find a complete list of 34 themes with a short description. For more information, it is worth to go to the Gallup Institute website. People with the Achiever theme seem to have unlimited life forces. They work hard because they are energized by the results of their work. People with the Activator theme act as a trigger. They can quickly turn their thoughts into action and make others take action too. People with Adaptability theme are able to navigate round in any unexpected situation. They are able to go with the flow and discover the future only day after day. People with Analytical theme look for causes and reasons. They are able to consider and take into account any factors that may have affected a situation. People with the Arranger theme are able to combine all pieces and resources into a bigger entity to achieve the best maximum usability. People with the Belief theme relate to some fundamental principles, which are strictly combined with the purpose of their life. People with the Command theme are usually easy to notice. They are able to influence others, make decisions, and take control of the situation. For people with the Communication theme, it is easy to put their thoughts into words. From their perspective, everything is a story. They are good interlocutors and often also speakers. People with the Competition theme love to compete. They measure their progress by the progress of others, and strive to get the first place. People with the Connectedness theme believe that everything is interrelated. Something like “coincidence” is more a result specific factors; everything has its cause and reason. People with the Consistency theme find all other people equal, and want to treat everyone equally. These people stick to clear rules that help them treat every person as objectively as possible. People with the Context theme, perceive the present from the perspective of what has already happened. Knowing history behind helps them better understand what is happening now. People with the Deliberative theme want to make good decisions. For this reason, before making a decision or making a choice, they deliberate thoughtfully, taking into account also what may go wrong. People with the Developer theme are delighted to recognize and develop the potential that lies within other people. Any signs of progress and development are a source of great satisfaction to them. People with the Discipline theme put order to their environment by creating structures and schedules, which they themselves also consistently hold on to. Everything around them becomes neat and well structured. People with the Empathy theme are able to imagine the feelings and states of others through connecting emotionally or mentally with their situation. People with the Focus theme are able to focus on their goal, taking necessary corrective actions so that they continue to stay on the right course. For people with the Futuristic theme, the future is happening now. They are inspired by what might happen and are able to inspire others with their vision. People with the Harmony theme look for areas that can help people get together and act. Instead of conflicts, they seek for an area of agreement, which will let everyone move forward. People with ideation theme live particularly close to the world of ideas, possibilities and options. They are able to discover relationships among events that would otherwise appear completely unrelated. People with the Includer theme try to include everyone into the group. They are particularly sensitive to those who could be excluded and ensure that everyone is accepted. People with the Individualization theme approach anyone as a unique person. They are able to understand how people who are completely different can work together effectively. People with the Input theme never cease to grow their collection – be it knowledge, good practices, experiences, or objects. In an impressive and comprehensive way, they collect all types of new input and are able to navigate around their huge database. People with the intellection theme are extremely active intellectually. Penetrating into the essence of things is a source of great pleasure; they highly appreciate intellectual discussions. People with the Learner theme enjoy learning and exploring new things, and they find the learning process itself more important than the end result. They have a strong need to improve themselves. People with the Maximizer theme can transform something that is already good into something that will be just perfect. They appreciate the strengths of their own and others, and they want to focus on what works, in order to develop it further. Enthusiasm of people with the Positivity theme can be contagious. They are full of hope and faith in a positive outcome of anything that happens. People with the Relator theme love to have close and long lasting relationships with others. Working with friends to achieve a common goal is a source of tremendous satisfaction to them. People with the Responsibility theme find honesty and loyalty the core important values. They feel internally responsible for what they have declared to do and can be relied on to stick to their promises. People with the Restorative theme draw the energy from noticing and correcting what is not working – relationships in a team, conflicts, living situations, but also objects. They can identify and solve problems. People with Self-Assurance theme believe that they walk the right path in life. They have an internal compass which guarantees that they take right decisions. People with Significance theme wish to be recognized for the contribution they make. They are independent and they want other people to treat them with great respect. People with Strategy theme create scenarios and options of possible actions. They can easily notice significant elements and patterns in any emerging situation. People with the WOO theme love to meet new people and win their liking. They enjoy making the first steps in a relationship with another person. Experienced Consultant, Trainer, Facilitator, and Coach. Expert and Speaker. Entrepreneuer and Manager. Founder and Managing Director of ETTA Global Leadership Consulting. Co-Founder and first President of SIETAR Polska, Society for Intercultural Education, Training, and Research.